We have been receiving a few emails lately asking if we ship to countries outside the USA. Shipping rates are calculated during checkout based on the weight of your purchase and type of delivery service you choose. UPS Ground is very inexpensive and allows next day delivery if you’re in our local area – within 150 miles to zip code 94903 – including San Francisco, Sacramento, San Jose, Oakland, and Santa Cruz. We’ve also enabled Next-Day Air, 2-Day and 3-Day service so you can decide the shipping speed you want. US Postal Service options include First Class, Priority Mail and Express Mail. And we ship all orders received by Noon the same business day. So you’ll get your order quickly, and discreetly in plain packages with no mention of the ErosTek brand. I just went to www.sextek.com and ended up at the ErosTek Online Store. What happened? — We’ve made some changes to make shopping easier. When we partnerned with and later acquired ErosTek, we saw the need to develop and deploy a more modern e-commerce site that would allow us to add products, show videos and enable new features to make buying faster and easier. This new site runs on its own secure (SSL protected) domain, with room to grow. The final step is now complete – Welcome to the new ErosTek Shop! Our new ErosTek Shop has been performing well since going live on 30-April-2011. Today I fine-tuned our email server so that your online order will send you email updates as it moves through our warehouse and a tracking number once it ships. If you registered during checkout, you can also log in and check your order status for any order you’ve placed in real-time. Cool! ErosTek products purchased by customers residing in the USA are warranted against manufacturing defects for One Year from the date of purchase by SexTek/ErosTek or an authorized dealer. This warranty does not cover misuse, abuse, wear and tear, batteries or products which have been disassembled or tampered with. There are no express warranties other than those listed here and no warranties whether express or implied, including, but not limited to, any implied warranties of merchantability or fitness for a particular purpose. No other warranty of any kind, verbal or written, shall bind ErosTek, SexTek and their related companies, members, agents, employees, affiliates and consultants (collectively the “Manufacture”). Further, the Manufacture shall not be liable for direct, indirect, incidental or consequential damages caused by the use, misuse or inability to use the product regardless of the legal theory on which the claim is based. Without limiting the foregoing, Purchaser assumes all risk and liability for loss, damage or injury to Purchaser, others and property arising out of the use, misuse or inability to use the product. Recovery of any kind against the Manufacture shall not exceed the purchase price of the product. Any claim or dispute arising out of, or related to, use of ErosTek products shall be submitted to an independent and objective arbitrator for binding arbitration. Binding arbitration shall be the sole remedy for any warranty dispute or claim and, by acceptance of the Use Agreement, the Purchaser expressly waives their right to file a lawsuit in any civil court seeking remedies from the Manufacture except to enforce a legally binding arbitration decision. SexTek/ErosTek will repair or replace defective products at no charge as stipulated herein with new or reconditioned parts or products during the warranty period. Contact SexTek/ErosTek for more information on obtaining service. A copy of the dated sales receipt is required for warranty repairs. The customer is responsible for shipping costs and properly packing the unit. Warranty rights vary from state to state. This Limited Warranty shall not extend to anyone other than the original purchaser, is nontransferable and states your exclusive remedy. Click on the file below to download the ErosLink 1.1A Updater. Running the Updater will upgrade your ErosLink 1.0 or 1.1 installation to the latest availble. The new user submitted routines are installed in the Designer directory. Only the original factory routines are contained in the Routines directory. To access the new routines from within ErosLink, open the Designer folder. If you used the default directory when you originally installed ErosLink, you only need run the Updater and click through the prompts. If you have ErosLink installed in a different directory, you must specify that directory when running the Updater. When the upgrade is correctly installed, the Help window should display ErosLink 1.1A in the upper left corner. The Updater includes updated help documentation (UserGuide.htm). If you have any problems with this upgrade, please contact SexTek for support. NOTE: If you have any problems, uninstall ErosLink and start over with your ErosLink CD and then install the updater to the same folder. This collection of ErosLink routines has been around for awhile, but it’s worth posting just in case you never got it the first time. The following ZIP file contains 96 ErosLink routines written for the ET-312 by various our customers. We do not provide any support for these routines and they are provided “as-is” with the customer assuming all liability for their use. Welcome to the ErosTek Blog. Here you’ll find the original ErosTek web sections along with new product announcements and stories from someone who gets wired up on a regular basis… me! 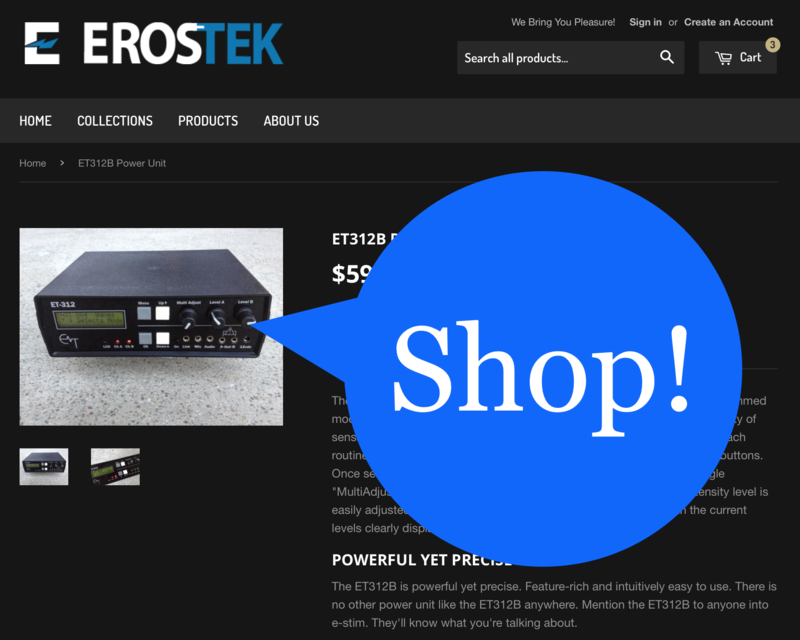 If you’re ready to buy an ErosTek Power Unit and/or accessories, please visit the ErosTek Online Store. I look forward to your comments and suggestions.